After decades of protest and a campaign of non-violent civil resistance that began in 1999 and included the arrests of over 1,500 people, the Navy was forced to close the bombing range on May 1, 2003. Peace-loving people had defeated the most powerful military force in history without firing a single shot. Presidential candidate Obama wrote to the Governor of Puerto Rico in 2008: "We will closely monitor the health of the people of Vieques and promote appropriate remedies to health conditions caused by military activities conducted by the U.S. Navy on Vieques." Health Care -- Provide a modern hospital with cancer treatment facilities, early screening and timely treatment for all diseases. Create a research facility to determine the relationship between military toxins and health. Provide just compensation to people suffering poor health as a result of the Navy's activities. 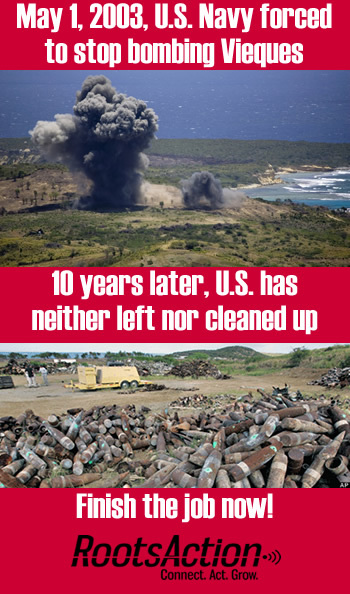 Cleanup -- Fund a complete, rapid cleanup of the land and surrounding waters, still littered by thousands of bombs, grenades, napalm, Agent Orange, depleted uranium and other explosives left by the Navy. Cease the ongoing open detonation of unexploded ordnance. Guarantee community participation in the cleanup; train Viequenses as managers, administrators, and scientists, and foster Viequense companies to do the work. Sustainable Development -- Support the Master Plan for Sustainable Development of Vieques which promotes agriculture, fishing, eco-tourism, small guest houses, housing, collective transportation, archaeology, and historic and environmental research, among other things. Demilitarization and Return of the Land -- Close the remaining military installations still occupying 200 acres of Vieques. Return to the people of Vieques all land still under the control of the U.S. Navy and the federal government. Helen Jaccard and David Swanson: "Vieques Vive La Lucha Continua 10 years after the bombing stopped"
Robert Rabin Siegal: "Dear Mr. President"
Helen Jaccard: "Interview of Lydia Ortiz"
Helen Jaccard: "Interview of Carlos Prieta Ventura"